Train 23# Although it may not be the ‘authentic’ experience, we were lucky enough to get a 4 berth cabin to ourselves for the trip from Beijing (8:05am 10 November) to Ulaan Baatar (1:20pm 11 November). Highlights included copious amounts of tea, 2 minute noodle picnics, lots of scenery gazing, the toilets being in much better condition than anticipated, and the chance to sit back & read, snooze, watch movies on the laptop at leisure. Lowlights were definitely 1) holy cigarette smoke! 2) total of 6 hours to cross the Chinese/ Russian border. This involves sitting on a very chilly train as the power is turned off, no toilet access and being violently shunted for the best part of two hours while the undercarriage of the train is changed to suit the tracks on the other side of the border. The steppe You certainly wouldn’t visit Mongolia for the capital, Ulaan Baatar, aptly named the coldest capital in the world. It is dominated by Soviet style buildings with very few ‘sights’ from a tourist perspective. It is home to the most pigeons I have ever seen in one spot and also boasts the dubious honour of being the first place I have ever seen to serve Margarita pizza (tomato, cheese and maybe some basil) with cucumber and not just one but two different types of meat on it. What you do come to Mongolia for is the magnificent countryside. Our first visit was to the Hustai National Park, where we spent two nights in a semi modern ger. 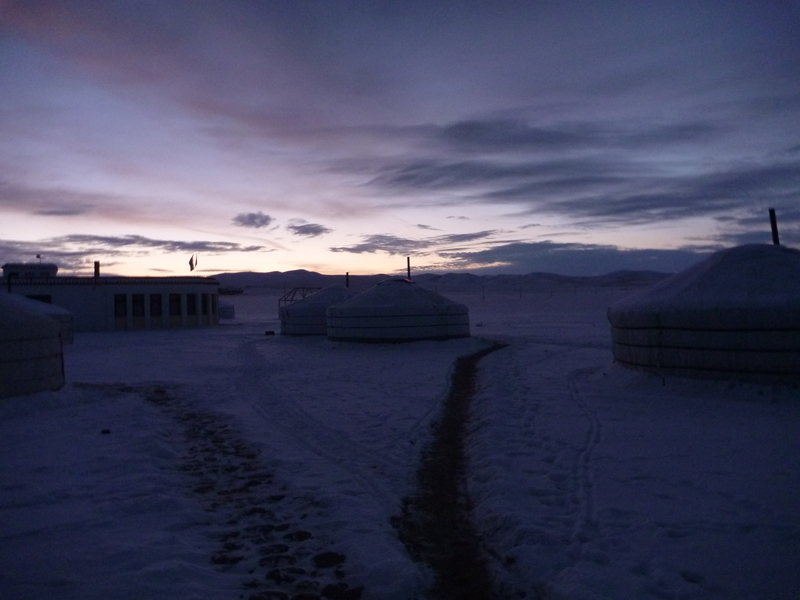 The odd paradox of Mongolia is that you are either painfully cold out on the beautiful snowy steppe or ridiculously toasted inside your ger hut in which the fire is kept well stoked. We spent a morning four wheel driving through the national park to visit an ancient burial ground and to look for yaks as well as wild and domestic Mongolian horses. Mutton free zone Despite the dire warnings of all of the travel guides, we were incredibly well fed here and the entire menu did not consist of mutton! At one lunch we were even fed four full courses, very helpful for building up a winter belly. Vegetarianism was no problem however our guide, Nasaa did comment on more than one occasion that perhaps I was cold because I didn’t eat meat. She also made it very clear that meat was necessary to be strong and healthy and that if a Mongolian was to miss meat at more than one meal that they would start dreaming about it. All of this anti vegetarian propaganda was delivered in a very friendly way; I’m just kidding, but seriously! Tether your dog! From Hustai, we moved to the Elstei Ger Lodge where we stayed in a traditional felt ger. 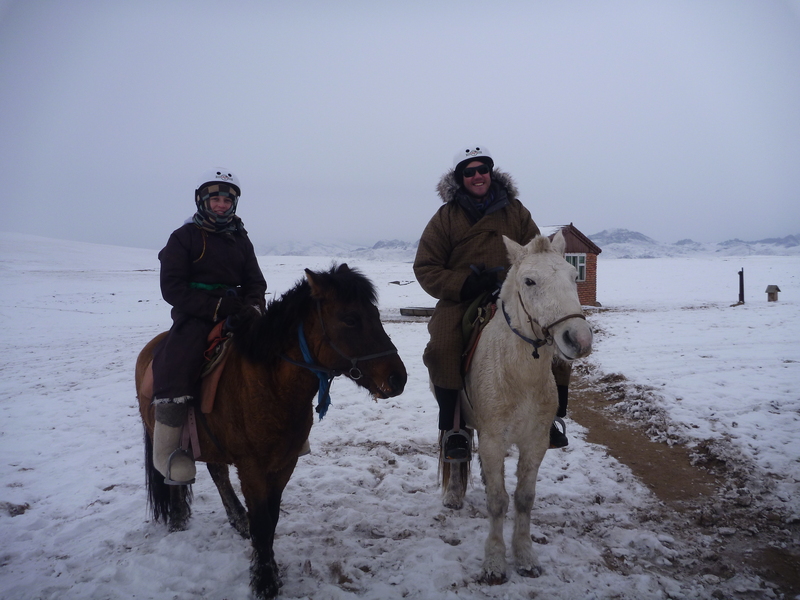 Here we had the opportunity to visit a nomadic family and to ride Mongolian horses on the steppe. The traditional greeting when approaching a ger is ‘Nokhoi Kor’ (tether your dog). This was not required on this visit but we were treated to traditional hospitality including salted ilk tea and freshly made butter with bread. We also had the meat theme reemphasised as we were sat between a gi-normous hunk of frozen sheep carcass and a bowl of blood. The family were very quiet but we were very appreciative of the opportunity to visit them in their home. Yak skin coat and felt boots Nasaa rugged us up in traditional Mongolian attire for our horse riding trip and despite the bulkiness, we were very happy to have it on to ward off the cold. Being out on the steppe on the horses was stunning. There was a gently snow fall while we were out and an incredible sense of the vastness of the steppe. An incredible experience despite the fact that my horse was a fairly truculent and needed to be linked to the horse master and that Ryan’s horse was a little slow and gassy! Otherwise a spectacular experience. Post script Other notable experiences included learning to play traditional ankle bones games (played with sheep’s ankle bones), trying to CrossFit in subzero temperatures (painful) and the long trek through the snow to the longdrop toilet! This entry was posted in Matryoshka, White Christmas and Reindeer Burgers, Travel and tagged Mongolia, Trans Siberian. Bookmark the permalink. Was the butter made with yak milk? I believe that it has an interesting flavour. I think it may have been. We’ve tried a few interesting fermented milk concoctions!! I really like to read your stories. It is amazing what the both of you see and do!